Huay Yai Land. 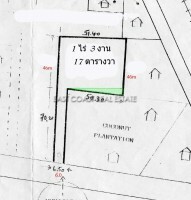 This beautiful 3 Rai 177 Wah², corner plot of land is set directly on the roadside, so is a perfect visible parcel which would be perfect for either starting a small housing development, build your own home or even taking advantage of the position and choosing to develop shops, or markets on the land. Its positioned very close to the newly extended Bangkok motorway and the overpass/ exit point is only a few minutes away. This area is bringing in strong interest from Bangkok buyers, plus the local area is starting to increase the amount of local amenities to support the expanding community. This plot has immediate access to government electricity, and water supplies are simple to connect. The whole plot is owned in Thai Company name.